A stitch in time… – …STILL CRAZY AFTER ALL THESE YEARS! Long, long ago, the girl students in the schools here had to learn how to cook and sew. There was a subject called Home or Domestic Science and there would be a room specially for the teaching of this subject. In one of my previous schools, in the 80’s, it was right next to the staff room and whenever they cooked anything, the teacher would ask us to go over and try and give our comments. Gee!!! Without my realising it, I was already a food critic then! LOL!!! The boys had to do Woodwork…and I was one of them in the early 60’s. How I hated the subject!!! It was such hard work, so very tiring…and I had no interest in it whatsover. I wonder why there had to be such discrimination at the time – why couldn’t boys learn to cook and sew if it was to their liking and interest? Eventually, they changed it to Kemahiran Hidup (Living Skills) – I think they still have this subject today, if I’m not mistaken. The students are taught a bit of everything – jacks of all trade, masters of none. In the end, they hardly learn anything and the sad thing is that most, if not all of them, are, in fact, good for nothing. But to be fair, I did not learn cooking in school, nor sewing, but still, I would say I can manage quite well on my own. I guess it all boils down to the individual – whether you are interested in it or not, whether you want to learn or not…or do you prefer to just push everything to others and let them do it for you? Anyway, when we were in Auckland, New Zealand in December, one night, everybody went out while I stayed in the house, having a much-needed rest after a long day of touring and what not. Well, they went shopping, it seemed, and my missus bought me this pair of tracksuit-like pants that turned out to be so very long. It seems that when you buy long pants, trousers or jeans, in a shop, they are usually very very long and you will have to get the people to cut them short. 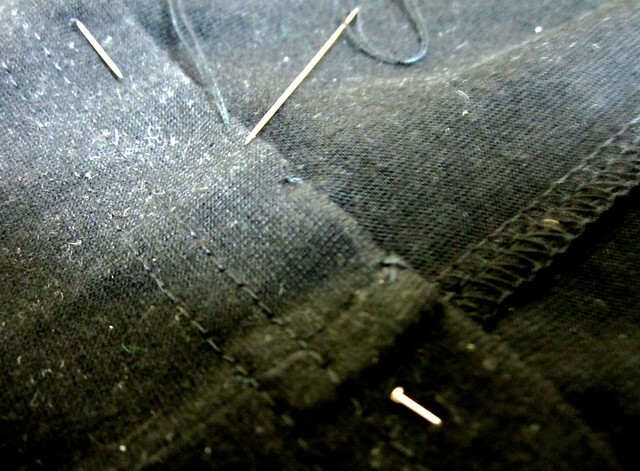 Otherwise, you will have to bring them to a tailor to get the alteration done…for a price, of course. Well, to me that is not a problem as, believe it or not, I can do it myself. This would be my starting point and I would start sewing from here. It did not matter as the thread would be inside and would not be visible at all from the outside. …and not too much as this would be visible on the outside and it would look quite awful if the thread ended up in full view. 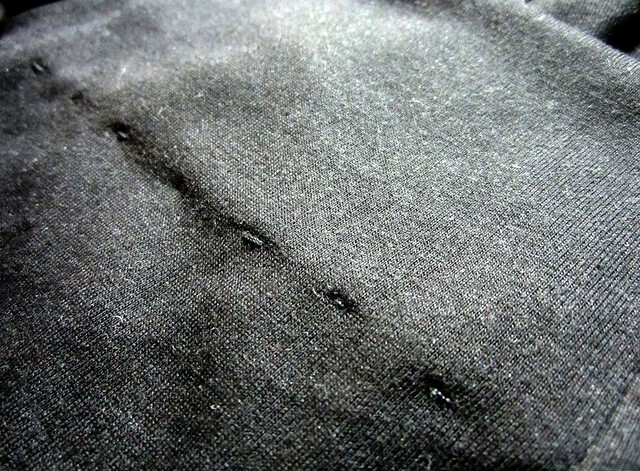 …and thus, the hem would now be attached to the side of the trousers on the inside. Ooooops!!! Some are a bit longer and more visible than the others but who cares? Nobody is going to scrutinise so closely and carefully and criticise, I’m sure! …and eng…eng…eng!!! Just nice, don’t you think? Hehehehehehehe!!!! People called our bell-bottoms in the 60’s road-sweepers (sau kay lor) which wasn’t exactly true. As a matter of fact, they hardly touched the ground but today, I see these young people and the not-so-young ones as well, ladies included, wearing those jeans that are way too long for them and they just drag them along the ground until they get really dirty and so horribly tattered and torn. On rainy days, they would get so very wet that you would be able to see a darker shade of blue (or whatever colour) as the water soaks up the legs of the jeans…gradually. I wonder why they did not get the people at the shop where they bought the jeans to do the alterations for them nor did they send them to a tailor…and it is pretty obvious that they are not in the least bothered to do it themselves. Is it some kind of a latest fashion or what – wearing jeans that are so very long? Perhaps somebody would care to enlighten me on this? Domestic Science. I actually wanted to take that up but my teachers refused to allow me to do it. You must be a pretty smart student. In one of my former schools, some boys were asked to take the subject instead of some other, can’t remember what subject now…and when I asked them why, they said it was because the teacher said they were the stupid ones! Tsk! Tsk! But at least, they really enjoyed themselves taking up that subject…especially the cooking (and eating). I remember those classes in 8th grade. Great life skills! I would think it would be a lot more interesting that those dreary chalk and talk lessons…with tons and tons of homework. Nicely done. I remember I learnt stitching at “Kemahiran Hidup” classes in secondary school, but most boys, including me, would not pay attention as we think that this is a girl thing. Thinking back, this is a rather good life skill worth acquiring. At least, I can help to mend some of my boy’s torn clothing. Precisely!!! Yes, and clothes these days not like before – they tear quite easily. Pull a loose string and the whole thing comes off. Can’t leave it to the missus all the time – small matters like this, can help out. I’m sure your wife would be grateful for the little help she gets. Bringing up children is a handful, not that easy…especially if couples are staying on their own, no adults around to lend a hand. Yup! That’s about all I can do. 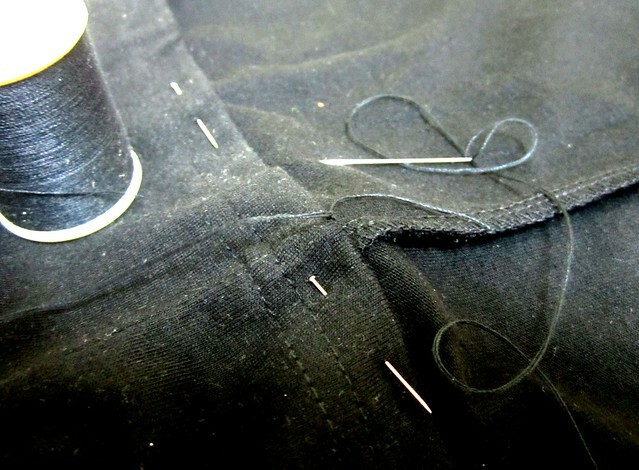 A tear in the pants, a loose button – can easily do it ourselves. Tak kan lah wait for the mother…or missus to do small things like that. Master of all trade, from chef to zoo keeper and now tailor. Last time in school, I took up Home Science and thus quite pro in doing this. For jeans, I send to tailor cos difficult to do it on our own, material thick but nowadays jean material is light. 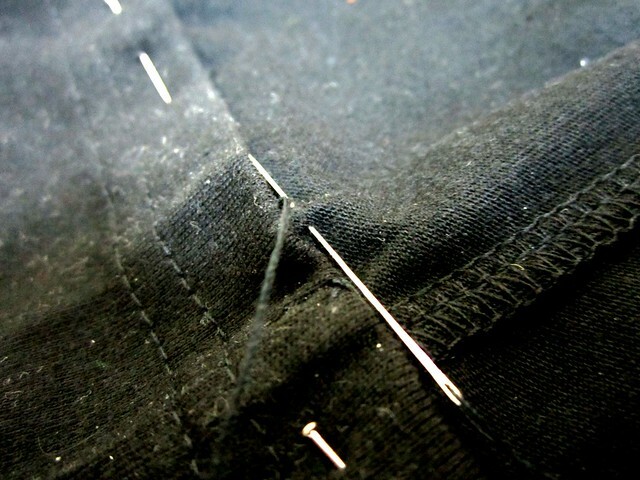 Always choose the colour of the thread nearest to the trousers material so the hem won’t be so obvious. See! Home Science IS a useful subject, so practical and so very useful. You’re right. I don’t buy thick blue jeans – so fat, sweat a lot…and they get very smelly after a while. That would be hard to sew as the denim material is so thick and hard like canvas. Hmmmm…sometimes, no thread of similar colour in the house, I just hantam also – ok for stitches not visible on the outside. Besides, old man already – never mind lah!!! As long as can still use, ugly also…who cares? Hehehehehehe!!!! Wah!! You should teach housekeeping from home! I see that you can tidy your house so neat, cook and now sew!!! What a woman could do, Arthur does it better! I never could stitch anything although i tried to stitch my boxer shorts many times. They would still rip apart. Perhaps you should get shorts a few sizes bigger – face it! You’re too fat…for those tiny skimpy ones. Muahahahahahaha!!!!!! No? Not even making sandwiches? I know they taught one or to the most two dishes – hardly enough for anybody to really learn how to cook. Maybe your teacher just skipped that – cannot cook himself/herself. Good grief! I’ve seen those with a big tear on the thigh or some place. I guess that is the fashion. Humph!!! Send them to a tailor. Good enough that I do my own. Hehehehehehe!!!! Yeap! 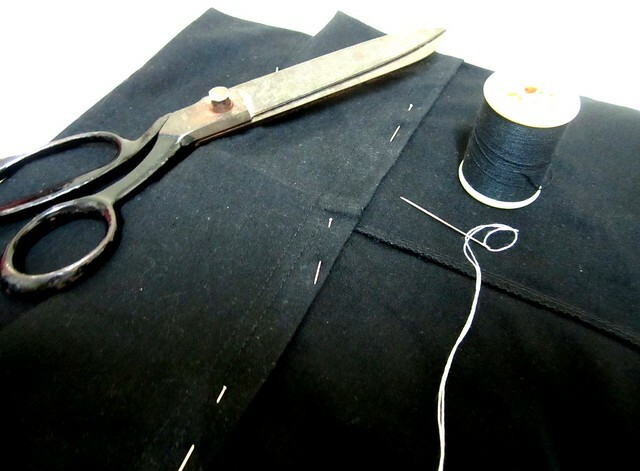 I remember that subject, I did it from Form 1 to Form 3 and I hate when it is the sewing subject. 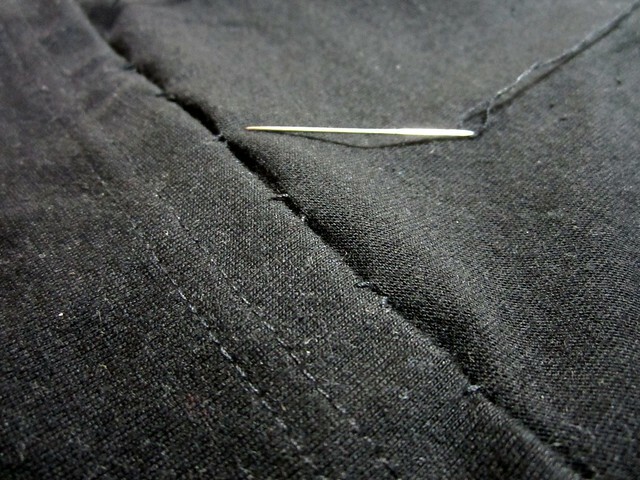 So, my sewing till now is not good. hahaha! That time, I also need to do the woodwork and cooking. It was fun and a great experience. Yours would be Kemahiran Hidup, I suppose? Sewing, just a little bit. My girl had a piece of cloth on which she did some stitches, that was all. Woodwork – had to make a shelf or a pepper rack…and cooking, just a dish, I think…and also, some wiring works. A bit of everything – really not enough to really learn. Errr… do you need to wear glasses to do that? Nope! Not at all…but preferably, the needle has to be a bit bigger. The very small ones can be quite a problem sometimes. Not bad for an over-60 year old, eh? LOL!!! Nicely done! When I did that subject, we had to do all cooking, sewing, electronic, and that wood thingy where we each had to make a wooden stool (mine is stilll in my home balcony I think). And the 2 dish I remembered so well is the fried noodle and fried rice. The textbook is what I hated most….I’m impress how the hand on skills are transformed into theory and put into words to torture the students (me). Lol..
Never seen the textbook. Ya…I know they cook one or two simple dishes only, nothing much…or one will cook, the rest will watch. They teach a lot of stuff but just a little a bit of everything. I would think it is better to let people specialise – many still can’t do what they were taught after passing the subject in school. I think there are two streams – there’s a cooking one and a woodwork one. I loved it, our team cooked a great final dish, still remember rushing to Ngiu Kee (back when it was near my school – outlet is now closed) to get chilli sauce coz we forgot. wow.. another “Handy A”.. not Andy but Arthur… ! The cloth looks very thick.. not easy to sew by hand, man… you did a good job ! Salute you , STP, you can do such a detailed work, and it is a very nice sew up. Looks neat and nice. Thumbs up to you. Eh, where got Lucy bought long pants for you?.. 3/4 pants, right? Anyway, why didn’t you tell me that you are so good at sewing? You could repair a few of my pakcik’s pants:) I wish I was allowed to take home science too. I think I would have done better than taking accounts.. yucks! Got! Two shorts and one long! No problem, just keep them there…next time I go, I would stay home…and sew for you…and cook and water the plants and sweep the dog poo – for free board and food…and stay longer. Hehehehehehe!!!!! This is what I hate the most during my high school days. We also had a subject like your Domestic Science. The funny thing is that we are taught how to sew, how to cook, how to apply nail-colors and those things that are found in the parlor. I truly hate those things (excluding the lessons about cooking). I don’t know how to sew that’s why I had to ask my sister to my torn clothes for me. 🙂 But I don’t regret that I don’t have such talents. You had? That’s interesting. Good skills to learn and master – some make a career out of these actually…and are very successful. Neat kah, some big, some small like that? Ya…SRT = Home or Domestic Science lah. Oh, forgot! You people there, changed medium of instruction earlier. Here, by the time we changed…not long after that, no more that subject – changed to Kemahiran Hidup. Here in the USA, when I was a child, they taught Home Economics that’s not a requirement anymore. I don’t think it’s even taught. You did a nice blind hem stitch on your pants. I do a similar stitching when I take up my fathers pants. 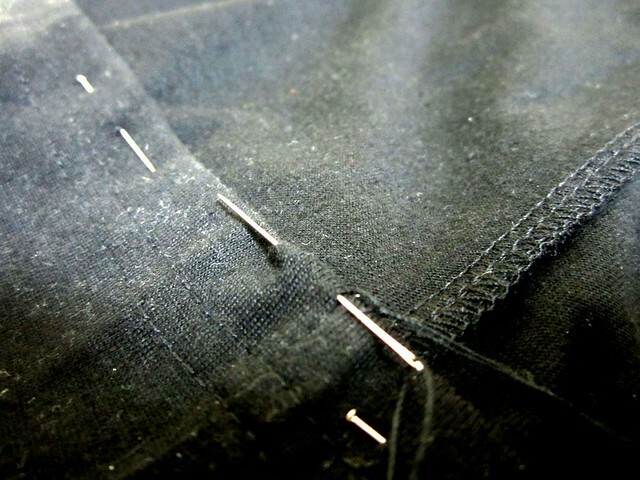 If I don’t feel like doing it by hand, I’ll do it with one of my sewing machines since it can do the blind hem stitch. I have a traditional old school sewing machine. It only does a few stitches, but it’s still my favorite machine. It’s a Singer made in the 1960s, my mother gave it to me since I love to sew. Even though I have computerized sewing machine my old school Singer machine will always be my favorite! It’s all metal and extremely heavy! My mum has a Singer too. She’s keeping it – from the 50’s, I think when she got married. Ours is a made-in-China one, not that good. of course. I think you did a better job than I would… the stiches are neat! 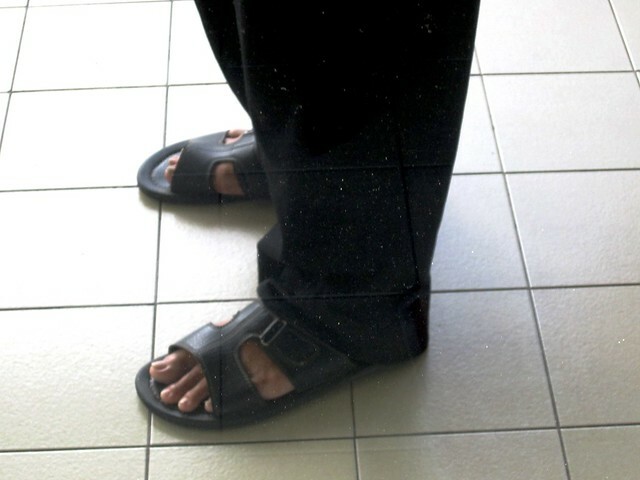 Not really neat lah – some big, some small. My missus does it a lot better…. Maybe you didn’t think it would be useful…so not interested.